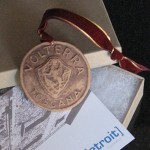 The Volterra-Detroit Foundation has been nominated for the Give Detroit Challenge. We are in a great company of other 49 non-profit organizations which are from Detroit and about Detroit. We are part of Detroit! The company is fantastic, but the idea of the challenge is that the Foundations compete with each other – who will raise the most money from October 1st until November 12. Just 43 days, six weeks. If we finish first, second or third, we will receive a cash bonus from the sponsoring organizations. If we don’t place, we still win – we are part of the challenge, we will have had lots of fun, and we will raise some funds for our activity. There is no cost to be part of the challenge, it is all for a better good. So, we are in! Click here to visit the Volterra-Detroit Foundation page on Crowdrise and make a donation. Your contribution of just $10 will put us one step closer to our fundraising goal, and maybe help us win one of the Give Challenge cash prizes! This time the Volterra-Detroit Foundation is fundraising specifically to start a new program in Volterra: ARTIST in RESIDENCE [air]. A residency program for Detroit and Michigan artists in Volterra (Italy) at the Volterra International Residential College. Your help will give our growing art community an international voice, experience and growth opportunities. During the program the participants arriving from Michigan will be paired with local artists in Volterra to collaborate, expand their artistic vision and form lasting bonds of friendship. Each residency program will be concluded with art exhibitions in Volterra and Detroit. The program will also include travel to the historical and contemporary art centers in Italy and Europe. The Volterra-Detroit Foundation has well established relationship with the artistic community of Volterra through many years of the academic study abroad programs of the University of Detroit Mercy and other projects of the international cultural and artistic collaboration. The Foundation activity is centered on the Volterra International Residential College facility in Volterra, where the Detroit artists will reside for the period of their residency in Italy. The artistic spirit in Volterra is very strong. The most notable of all, and most unique, is the long tradition of sculpture in alabaster, which permeates the entire city, and is one of the most important aspects of the Volterra identity. The Volterra-Detroit Foundation is capable of miracles. With help from many of you we created the place in Volterra we can call home: the Volterra International Residential College. Now we want to share it with the Detroit art community. A tiny little contribution of just $10 from many of you, just a gesture of good will and hope, and we will reach our goal! We will be very grateful for your support! 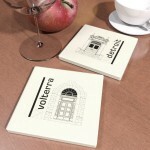 A set of two stone coasters, with the images of the entry portals of the University of Detroit Mercy School of Architecture building in Detroit, and the Volterra International Residential College in Volterra. A $100 donation will be recognized with this unique gift.